If you are thinking about moving, you should consider being as eco-friendly as possible. There are many small things that you can do that will help the environment while making your move a simpler process. Enjoy using these tips whenever you are thinking about relocating your home. If you have a lot of items, you may consider donating some to charity so that you can rent a smaller moving truck. This will be a good choice for the environment, and you can feel good about donating items to help people that really need them. You can donate everything from clothing to furniture. There is no reason to buy new boxes to pack items when you can use boxes that have already been used. Check out your local grocery store or even a liquor store that may have plenty of boxes that you can have for free. You want to make sure that you pick out sturdy boxes and make sure that you have the bottoms of the boxes taped securely so that nothing falls out during the moving process. Instead of purchasing packing peanuts or bubble wrap to wrap your fragile household items in, be creative. You can wrap items in towels or shirt. You are going to be packing these items anyways, so using them to protect your breakable items is a good idea. You can also use old newspaper to wrap glass and other valuable items in so that they do not get broken during transit. less vehicles for transport – reducing your carbon footprint even further. If you are moving a long way away from your home, it may be more cost effective to buy new furniture and appliances. You can find many nice furniture items in your new location by visiting furniture stores or yard sales. You can often buy a nice looking piece of furniture that is gently used for less than the amount of money it would take to ship your old furniture to your new location. You can also invest in energy star appliances that are good for the environment and can help you save money on your energy bill each month. You have many different moving options to choose from depending on how far you are going to be traveling and how many items you are going to be bringing with you. You can rent a trailer and pull it behind your vehicle or rent a moving van or truck. If you need to, you can also hire a professional moving company. There are many companies out there that specialize in green moving techniques. You should take your time and enjoy finding the best moving solution for your specific needs. You want to find ways to move that are good for the environment. As added bonus, many eco-friendly solutions are also very affordable. You can enjoy saving money and having a safe moving experience at the same time. As world population grows and the planet heats up, the effects of anthropogenic strain on the environment become ever clearer. This has created a fervor worldwide to solve the problem across the board. How can we maintain our highly processed civilization without creating a hugely negative impact on the environment? The answer is we can't. For our civilization to continue to grow, we will have to find ways to thrive within the needs of the environment. There are several solutions that are slowly beginning to evolve in response to the drastic impact we have had on the planet, such as solar and wind power, lower emission cars, and legislation budding all over the world which is aimed at environmental protection. For many of us, these bigger causes can seem lofty and disconnected from our personal lives. The most personal impact we can make on the environment in addition to supporting positive legislation is to reduce our own carbon footprint as much as possible. In addition to an extreme variety of other lifestyle changes that could be used to meet this goal, recycling is an attainable way to participate in the crusade for a healthy planet. There are still many gray areas when it comes to recycling in it's current state, however. In a blog post on Trailer Trash, Bernard Salt, although he misses the bigger picture of recycling at a conceptual level, raises some very good questions about the efficiency of the current system. The idea of cost effectiveness in waste management is discussed as it relates to the necessity of running multiple collection systems to send recyclable and non recyclable items to separate locations. Perhaps even more important is the carbon footprint left by these multiple collections and how that rates comparatively to just plain not recycling. This is a fair critique of the current system. However, we are barreling towards a solution to this problem and it is becoming clearer that it is simply more recycling. Recently, at Tulane University, scientists have discovered a new bacterial strain that can convert paper into butanol, which is a bio-fuel that can be used as a substitute for gasoline. By developing garbage trucks that run on recycled materials, not only are the fuel costs contained within the corporate structure of the waste management system, but would also perpetuate another step towards a system that is in sync with nature. In raising questions, we create room for ingenuity. Setting a standard that we should all recycle initiates creative discourse about the process. What type of realistic incentives should be set into place to encourage more people to recycle? One recent solution is the PAYT (Pay As You Throw) initiative which has taken root in many communities across the United States. The program encourages residents in areas that have put it into place to generate less waste. The incentive here is that residents under a PAYT program are paying for trash pickup by the bag instead a standard rate, which encourages the finding of ways to lessen waste in order to save money. The program has shown waste disposal declining by 14 to 27 percent on average in communities which have adopted it. Solutions like this one set a standard which is mutually beneficial for everyone involved. Re-using objects is another excellent way to help propel a holistic environment. Whether due to the disposable nature of our society or the other potential factors involved in the overall decreased attention to this important aspect of waste management, turning trash into treasure has moved a bit to the background of the overall conversation. 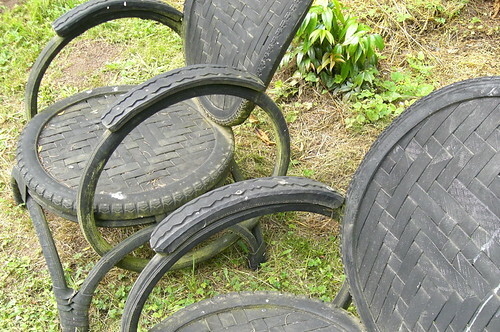 Some of the best ways to help lessen our environmental impact involve finding new and creative ways to use old objects instead of throwing them away. The choices are infinite when it comes to reusing old objects, and for a creative person, can be the biggest initiate of all to recycle more. Some excellent examples of this are things like turning cardboard boxes into bridges, making bicycle tires out of old shoes, or even things as simple as turning old wine corks into a bulletin board. The possibilities for us to make old objects useful again are literally endless, and with each new creative project undertaken, lessen our damage to the earth more and more. 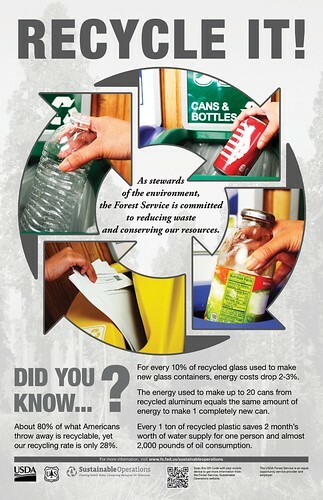 The mantra "Reduce, Reuse, Recycle" is one that most of us are familiar with. Much of the focus and rhetoric on lessening our carbon footprint is based in the basic "Recycle" part of the issue, but what about the rest? Examples like the PAYT program offer creative solutions to the reduction aspect of going green. There are many other ideas out there that are equally as plausible. By creating a platform for the exchange of ideas, it is fully possible for the human race to make viable changes in order to benefit our home. Focusing on all areas of recycling, and finding creative ways to recycle befitting our own lives is our best chance of reversing the negative impact humans have had on our surrounding environment. It is up to each of us to bring our own solutions to the table and work together to make a larger difference.